(2013) "Don't Kill the Magic"
"Rude" is the debut single by Canadian band Magic! from their debut studio album, Don't Kill the Magic. It was originally released on October 11, 2013 as a promotional single and then re-released on February 24, 2014 by Sony Music Entertainment. The official remix for the song features Kid Ink, Ty Dolla Sign and Travis Barker on the drums. "Rude" was an international commercial success amidst mixed reception from music critics. The song peaked at number six on the Canadian Hot 100 and internationally topped the charts in the United States and the United Kingdom and peaked within the top ten of the charts in Australia, New Zealand, Ireland, Denmark, the Netherlands and Sweden. "Rude" was the ninth best-selling song of 2014, with global sales of 8.6 million units, and won the Juno Award for Single of the Year. A 22-second sample of "Rude", a pop and reggae fusion song. "Rude" was written by Nasri, Adam Messinger, Mark Pellizzer, Ben Spivak and Alex Tanas, and produced by Adam Messinger. According to the sheet music published by Sony/ATV Music Publishing at Musicnotes.com, "Rude" is a reggae fusion song set in common time with a tempo of 72 beats per minute. This song is written in the key of D♭ major. "Rude" was named after the reggae term "rude boy" and originally based on a real-life situation. The lead singer of Magic!, Nasri, had been in an unhealthy relationship with a previous girlfriend. After the two of them got into a fight with each other, the band based the song off that headline. The couple was in a "mean time" when they were both being rude to each other, as Nasri says in what he describes as a "dark vibe." Critical reviews for "Rude" have been mixed. On a positive note, 4Music complimented the song, saying: "One listen and you'll be hooked." An article in Psychology Today drew a connection between the lyrics of the song and social attitudes about interracial relationships, while Time magazine named "Rude" the worst song of 2014, criticizing its "sanitized reggae-fusion sound" and lyrics. Renowned for Sound gave "Rude" a 4 out of 5 star rating, calling the track "lighthearted fun." On December 9, 2013, the band made their Australian television debut on Sunrise, where they performed "Rude". In June 2014, the band performed an acoustic version of the song on On Air with Ryan Seacrest. In July, they performed it on The View and on The Tonight Show Starring Jimmy Fallon. On August 10, 2014, the band performed the song at the 2014 Teen Choice Awards. Magic! and American singer Marc Anthony performed a Spanglish version of the song at the 15th Latin Grammy Awards ceremony in 2014 with Anthony singing parts of the song in Spanish. On July 15, 2015, Postmodern Jukebox released a cover version of the song on YouTube, featuring Von Smith. In September 2015, American singer Selena Gomez covered the song on BBC Radio 1's Live Lounge. The music video features the band singing the song in a garage while scenes show Nasri in a relationship with a beautiful woman played by model Ayla Parker. After this, Nasri asks her conservative father, played by actor Brian Knudson, for her hand in marriage, but the father refuses and won't explain why. The mother, played by actress Mary Kay McCartney, is somewhat softer. Eventually, Nasri secretly proposes to her and together with the rest of the band, try to convince the father, but he still refuses. Nasri marries her anyway and all party in the garage as Parker proclaims her love for Nasri and she abandons her overprotective father's house once and for all. The video was released on the band's YouTube account on December 5, 2013. As of March 2019, the video has over 1.6 billion views on YouTube, and is one of the top 50 most viewed videos on the site. On 2 September 2014, Russian-German DJ and record producer Zedd released a remix of the song through Sony Music Entertainment lasting 4 minutes and 33 seconds. "Rude" entered the US Billboard Hot 100 at number 97 on May 10, 2014. On the issue dated July 26, 2014, the song reached number one, marking their first and only number-one single. "Rude" spent six consecutive weeks at number one. On the chart issue dated September 6, 2014, the song tumbled from number one to number 5 on the Hot 100 as Taylor Swift's "Shake It Off" debuted atop the chart. This is the first time since The Black Eyed Peas' "I Gotta Feeling" that a song fell all the way to the number 5 spot after spending as many as six weeks atop the chart. The song has spent 16 weeks in the chart's top ten. Magic! is the sixth Canadian band to top the Billboard Hot 100, the first since Nickelback with "How You Remind Me" in 2001. It is also the ninth reggae song to reach the summit, the last being Sean Paul's "Get Busy" in 2003. "Rude" reached number two on the Billboard Hot Digital Songs on June 18, 2014, selling 207,000 digital copies. The following week the song peaked at number one, selling 210,000. It is only the second reggae song to top the Billboard Hot Digital Songs, after Sean Kingston's "Beautiful Girls" in 2007. The song was certified three-times Platinum by the RIAA in September 2014 and has sold 3 million copies in the US, as of January 2015. "Rude" peaked at number six on the Canadian Hot 100 and remained on the chart for 69 weeks. In Australia, "Rude" peaked at number two on the Australian Singles Chart. In New Zealand, the song peaked at number two on the New Zealand Singles Chart. In the United Kingdom, "Rude" debuted at number fifty on the UK Singles Chart on July 20, 2014 ― for the week ending date July 26, 2014 ― before climbing to number two a week later. The song topped the chart on August 3, 2014 ― for the week ending date August 9, 2014 ― becoming Magic! 's first chart-topper in Britain. The song has peaked at number two in Ireland. ^ "IFPI publishes Digital Music Report 2015". International Federation of the Phonographic Industry. April 14, 2015. p. 12. Retrieved April 15, 2015. ^ "Rude - Magic!". AllMusic. Retrieved March 12, 2014. ^ "Producer / Songwriter Adam Messinger - Pensado's Place #181". YouTube. September 18, 2014. ^ "MAGIC! On "Rude" Backstory | Interview | On Air with Ryan Seacrest". Ryan Seacrest Presents. June 12, 2014. Retrieved February 20, 2015. ^ Kyle D Killian Ph.D. (January 17, 2014). "Why You Gotta Be So Rude? I'm Gonna Marry Her Anyway". Psychology Today. Retrieved February 20, 2015. ^ "Top 10 Worst Songs". Time. Time Inc. December 2, 2014. Retrieved December 11, 2014. ^ Ryan, Ben (November 13, 2013). "Single Review: Magic! - 'Rude'". Renowned for Sound. Retrieved June 17, 2018. ^ "Magic! perform 'Rude' LIVE". Yahoo. December 10, 2013. Retrieved August 16, 2014. ^ Perricone, Kathleen (June 12, 2014). "Magic! Talk About Mega-Hit 'Rude' — and Perform It In-Studio!". Ryanseacrest.com. Retrieved August 16, 2014. ^ Asanka D (July 11, 2014). "Watch Magic! Perform 'Rude' on "The View" & Jimmy Fallon's "Tonight Show"". Jamsplay.com. Retrieved August 16, 2014. ^ "VIDEO: Magic! Perform 'Rude' on TONIGHT SHOW". Broadway World. July 11, 2014. Retrieved August 16, 2014. ^ Torrelio, Sebastian (August 11, 2014). "Best and Worst of the 2014 Teen Choice Awards". Variety. Retrieved August 16, 2014. ^ Roiz, Jessica Lucia (November 21, 2014). "Marc Anthony and Magic! at the Latin GRAMMYs was simply amazing". Voxxi. Archived from the original on December 4, 2014. Retrieved November 24, 2014. ^ "Rude - Vintage 1950s Sock Hop - Style MAGIC! Cover ft. Von Smith". YouTube. Postmodern Jukebox YouTube Channel. January 28, 2016. Retrieved January 28, 2016. ^ Menyes, Carolyn (September 25, 2015). "Selena Gomez Covers MAGIC! 's 'Rude' Ahead of 'Revival' Release for BBC Radio 1 [WATCH]". Music Times. Retrieved September 26, 2015. ^ "Resume". Brian Knudson. Retrieved February 20, 2015. ^ "MAGIC! - Rude". ournameismagicVEVO. December 5, 2013. Retrieved February 20, 2015. ^ "Most Viewed Videos of All Time (Over 450M views)". YouTube. Retrieved May 15, 2016. ^ "Rude - Magic! - Digital download". Amazon. Amazon Germany. Retrieved July 18, 2014. ^ a b "Rude - Magic! - Amazon Germany". Amazon. Amazon Germany. Retrieved July 18, 2014. ^ "Rude - Single (Zedd Remix) by MAGIC! on Apple Music". itunes.apple.com. ^ "The Hot 100". Billboard. May 10, 2014. p. 10. Archived from the original on May 2, 2014. ^ Trust, Gary. "Magic! 's 'Rude' Tops Hot 100; Iggy Azalea's 'Fancy' Falls to No. 2". Billboard. Retrieved July 16, 2014. ^ Caulfield, Keith (June 18, 2014). "Jack White's 'Lazaretto' Debuts at No. 1, Sets Vinyl Sales Record". Billboard. Prometheus Global Media. Retrieved June 18, 2014. ^ Trust, Gary (June 25, 2014). "Iggy Azalea Leads Hot 100 For Fifth Week, Maroon 5 Debuts In Top 20". Billboard. Prometheus Global Media. Retrieved July 1, 2014. ^ Grein, Paul (January 7, 2015). "Mark Ronson, Bruno Mars Jump to #1 on Hot 100". Retrieved January 7, 2015. ^ "Australian-charts.com – Magic! – Rude". ARIA Top 50 Singles. Retrieved June 13, 2014. ^ "Austriancharts.at – Magic! – Rude" (in German). Ö3 Austria Top 40. Retrieved June 26, 2014. ^ "Ultratop.be – Magic! – Rude" (in Dutch). Ultratop 50. Retrieved June 13, 2014. ^ "Ultratop.be – Magic! – Rude" (in Dutch). Ultratop Dance. Retrieved June 13, 2014. ^ a b "Ultratop.be – Magic! – Rude" (in French). Ultratop 50. Retrieved June 13, 2014. ^ "Top 100 Billboard Brasil - weekly". Billboard Brasil. May 10, 2015. Archived from the original on January 6, 2015. Retrieved May 10, 2015. ^ "Magic! Chart History (Canadian Hot 100)". Billboard. Retrieved June 13, 2014. ^ "Magic! Chart History (Canada AC)". Billboard. Retrieved October 30, 2014. ^ "Magic! Chart History (Canada CHR/Top 40)". Billboard. Retrieved October 30, 2014. ^ "Magic! Chart History (Canada Hot AC)". Billboard. Retrieved October 30, 2014. ^ "ČNS IFPI" (in Czech). Hitparáda – Radio Top 100 Oficiální. IFPI Czech Republic. Note: Change the chart to CZ – RADIO – TOP 100 and insert 201426 into search. Retrieved October 30, 2014. ^ "ČNS IFPI" (in Czech). Hitparáda – Digital Top 100 Oficiální. IFPI Czech Republic. Note: Change the chart to CZ – SINGLES DIGITAL – TOP 100 and insert 201433 into search. Retrieved August 19, 2014. ^ "Danishcharts.com – Magic! – Rude". Tracklisten. Retrieved June 26, 2014. ^ "Magic! : Rude" (in Finnish). Musiikkituottajat – IFPI Finland. Retrieved August 4, 2014. ^ "Lescharts.com – Magic! – Rude" (in French). Les classement single. Retrieved August 4, 2014. ^ "Offiziellecharts.de – Magic! – Rude". GfK Entertainment Charts. Retrieved June 26, 2014. ^ "Chart Track: Week 34, 2014". Irish Singles Chart. Retrieved June 13, 2014. ^ "Magic! – Rude Media Forest". Israeli Airplay Chart. Media Forest. Retrieved June 13, 2014. ^ "Italiancharts.com – Magic! – Rude". Top Digital Download. Retrieved October 16, 2014. ^ "Magic! Chart History (Japan Hot 100)". Billboard. Retrieved July 13, 2014. ^ "Nederlandse Top 40 – Magic!" (in Dutch). Dutch Top 40. Retrieved June 26, 2014. ^ "Dutchcharts.nl – Magic! – Rude" (in Dutch). Single Top 100. Retrieved June 26, 2014. ^ "Charts.nz – Magic! – Rude". Top 40 Singles. Retrieved June 13, 2014. ^ "Norwegiancharts.com – Magic! – Rude". VG-lista. Retrieved June 25, 2014. ^ "Listy bestsellerów, wyróżnienia :: Związek Producentów Audio-Video". Polish Airplay Top 100. Retrieved October 20, 2014. ^ "Official Scottish Singles Sales Chart Top 100". Official Charts Company. Retrieved October 30, 2014. ^ "ČNS IFPI" (in Slovak). Hitparáda – Radio Top 100 Oficiálna. IFPI Czech Republic. Note: insert 201426 into search. Retrieved October 30, 2014. ^ "ČNS IFPI" (in Slovak). Hitparáda – Singles Digital Top 100 Oficiálna. IFPI Czech Republic. Note: Select SINGLES DIGITAL - TOP 100 and insert 201433 into search. Retrieved August 19, 2014. ^ "EMA Top 10 Airplay: Week Ending 2014-08-15". Entertainment Monitoring Africa. Retrieved September 16, 2015. ^ "Spanishcharts.com – Magic! – Rude" Canciones Top 50. Retrieved October 30, 2014. ^ "Swedishcharts.com – Magic! – Rude". Singles Top 100. Retrieved June 26, 2014. ^ "Swisscharts.com – Magic! – Rude". Swiss Singles Chart. Retrieved August 4, 2014. ^ "Official Singles Chart Top 100". Official Charts Company. Retrieved October 30, 2014. ^ "Magic! Chart History (Adult Alternative Songs)". Billboard. Retrieved June 13, 2014. ^ "Magic! Chart History (Adult Contemporary)". Billboard. Retrieved July 17, 2014. ^ "Magic! Chart History (Adult Pop Songs)". Billboard. Retrieved July 17, 2014. ^ "Magic! Chart History (Alternative Songs)". Billboard. Retrieved June 13, 2014. ^ "Magic! Chart History (Dance Mix/Show Airplay)". Billboard. Retrieved August 24, 2014. ^ "Magic! Chart History (Dance Club Songs)". Billboard. Retrieved January 24, 2015. ^ "Magic! Chart History (Latin Airplay)". Billboard. Retrieved January 24, 2015. ^ "Magic! Chart History (Latin Pop Songs)". Billboard. Retrieved January 24, 2015. ^ "Magic! Chart History (Pop Songs)". Billboard. Retrieved July 17, 2014. ^ "Magic! Chart History (Rhythmic)". Billboard. Retrieved July 17, 2014. ^ "Charts monitorLATINO". Archived from the original on April 8, 2015. Retrieved April 3, 2015. ^ "Top 100". Record Report (in Spanish). R.R. Digital C.A. August 20, 2014. Archived from the original on August 20, 2014. Retrieved August 16, 2014. ^ "Record Report – Top Anglo". Record Report (in Spanish). R.R. Digital C.A. July 25, 2014. Archived from the original on January 8, 2013. Retrieved July 25, 2014. ^ "ARIA Charts – End Of Year Charts – Top 100 Singles 2013". Australian Recording Industry Association. Retrieved January 7, 2014. ^ "End of Year Charts – ARIA Top 100 Singles 2014". ARIA Charts. Australian Recording Industry Association. Retrieved February 5, 2015. ^ "Track Top-50 2014". Hitlisten.NU. Archived from the original on January 8, 2015. ^ "Top 100 Single-Jahrescharts". GfK Entertainment (in German). offiziellecharts.de. Retrieved August 10, 2015. ^ "FIMI - Classifiche Annuali 2014 "TOP OF THE MUSIC" FIMI-GfK: un anno di musica italiana" (in Italian). Federazione Industria Musicale Italiana. Archived from the original on January 13, 2015. Retrieved January 19, 2015. ^ "Top Selling Singles of 2014". Recorded Music NZ. Retrieved December 27, 2014. ^ Copsey, Rob (December 31, 2014). "The Official Top 100 Biggest Songs of 2014 revealed". Official Charts Company. Retrieved January 13, 2015. ^ "Rhythmic Songs: Year End 2014". Billboard. Retrieved December 9, 2014. ^ "Canadian single certifications – Magic! – Rude". Music Canada. Retrieved September 12, 2014. ^ "Gold-/Platin-Datenbank (Magic! ; 'Rude')" (in German). Bundesverband Musikindustrie. Retrieved December 12, 2014. ^ "Italian single certifications – Magic! – Rude" (in Italian). Federazione Industria Musicale Italiana. Retrieved January 10, 2015. Select "2014" in the "Anno" drop-down menu. Select "Rude" in the "Filtra" field. Select "Singoli online" under "Sezione". ^ "Certificaciones" (in Spanish). Asociación Mexicana de Productores de Fonogramas y Videogramas. ^ "New Zealand single certifications – Magic! – Rude". Recorded Music NZ. Retrieved March 23, 2014. ^ "Magic! - Rude" (in Swedish). Grammofon Leverantörernas Förening. Retrieved November 11, 2014. ^ "The Official Swiss Charts and Music Community: Awards (Magic! ; 'Rude')". IFPI Switzerland. Hung Medien. Retrieved January 8, 2015. ^ "British single certifications – Magic! – Rude". British Phonographic Industry. Retrieved October 7, 2018. Select singles in the Format field. Select Platinum in the Certification field. Type Rude in the "Search BPI Awards" field and then press Enter. ^ "American single certifications – Magic! – Rude". Recording Industry Association of America. If necessary, click Advanced, then click Format, then select Single, then click SEARCH. ^ "Certificeringer - Magic! - Rude". IFPI Denmark. Retrieved November 12, 2014. ^ "Top 100 Streaming - Semana 45: del 03.11.2014 al 09.11.2014" (PDF) (in Spanish). PROMUSICAE. Retrieved October 2, 2014. ^ "Rude – Single by Magic!". iTunes Store. New Zealand: Apple. Retrieved July 20, 2014. 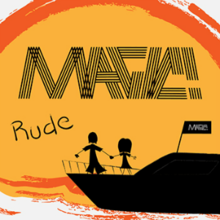 ^ "Rude by Magic!". United States: 7digital. Archived from the original on July 16, 2014. Retrieved July 20, 2014. ^ "Future Releases on Triple A (AAA) Radio Stations". All Access Music Group. Archived from the original on February 25, 2014. ^ "Hot/Modern/AC Future Releases". All Access Music Group. Archived from the original on March 16, 2014. ^ "CHR – Available For Airplay". FMQB. Archived from the original on March 13, 2014. ^ "Rude – Single by Magic!". iTunes Store. United Kingdom: Apple. Archived from the original on July 1, 2014. Retrieved July 20, 2014. This page was last edited on 8 April 2019, at 13:56 (UTC).